Located in the west central part of Honey Creek Township, just off Hwy PF on County Hwy C, the village was named after Cyrus Leland, who built a sawmill on Honey Creek in 1847. It was noted in the 1880 History of Sauk County, that "It had a large undershot wheel, and was altogether one of those groaning, squeaky old affairs that used to slowly thrash out the lumber." As with many small town sawmills, when their services were no longer needed, the water power they harnessed was transferred to the grinding of grist and flour. The mill pond also provided ice during the winter, to stock the ice boxes of local residents, and helped cool the beer in nearby taverns. The mill brought area farmers into town, and the Black Hawk State Bank attended to their financial needs during the 1920's, closing in the 1930's during the Great Depression. The village also had a blacksmith shop, a general store run by the Mielke family, and the Sprecher’s owned a general store and bar built in 1904. The Sprecher Tavern, at one time sported a dance hall where wedding dances were held. Junior and Donna Sprecher own the bar today and Junior recalled, in an interview several years ago, that when farm families finished a hard day’s chores, they’d head for the Leland Dance hall. At one end of the hall was a wooden stage from which the band played late into the night, entertaining those gathered with polkas, fox trots and waltzes. Wooden benches lined two walls for spectators. The Mielke Grocery & Merchandise Store purchased chickens and eggs from area farmers and sold them in Chicago. During the hard times of the Depression, a crate of chickens could be traded for a winter wardrobe to warm a small farm family. 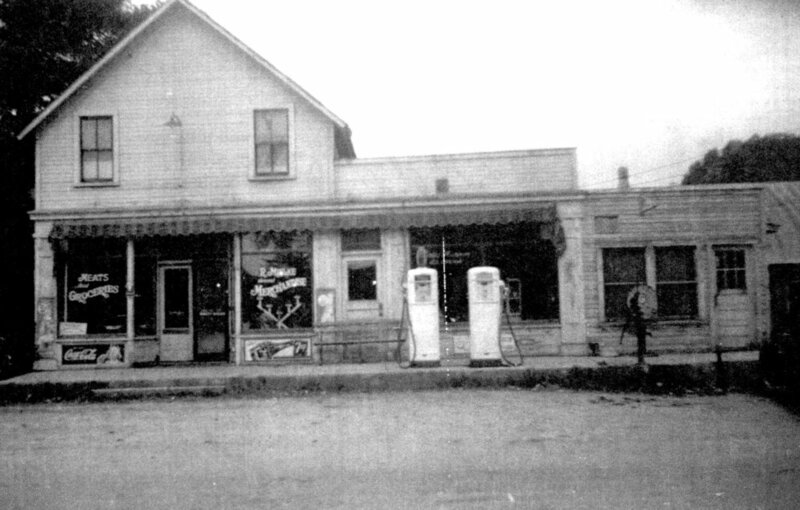 Begun as a tavern, Mielke converted to general merchandise when Prohibition dried up the nation. The store sold everything a country family could want, from fancy dishes to overalls, pots and pans to ice cream cones. Gasolene was also pumped near the front door. The store closed in 1972, and became a private home. The village had a post office from 1883-1907 and around 1900, the Leland Brass Band entertained at local events. During the 1950's, free shows were offered to area residents, sponsored by local businesses. It brought many into town to shop and wet their whistles. Movies were shown out of doors with spectators seated on blankets and folding chairs they brought for the occasion. During intermission, the race was on to get a quick 5¢ ice cream cone or soda, before the movie resumed. Today, the small village of Leland, with a population of approximately 50, has two taverns– Sprecher’s Bar and the Schellter Bar & Grill, and a beautiful park near the old mill pond (which is more like a small lake). The Leland Rod and Gun Club owns the pond and has placed club and shelter houses at one end, along with playground equipment. The dam was rebuilt in 1990 and the small lake behind it was dredged and fish planted. St. John Lutheran Church is also located at the east edge of the village, having been built in 1898. Just down the road from Leland, is the Natural Bridge State Park, which brings tourists and occasionally, archaeologists into the community. Excavations under the sandstone bridge rock shelter have revealed one of the earliest native American settlements in the state, dating back some 10,000 years.